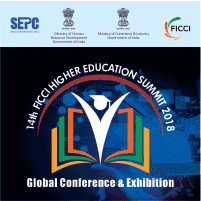 14th Higher Education Summit, 2018, a Global Conference and Exhibition is being jointly organised by the Ministry of Commerce & Industry, GoI, Federation of Indian Chambers of Commerce & Industry (FICCI) and Service Export Promotion Council (SEPC) from October, 31 to November 1, 2018 at Vigyan Bhawan, New Delhi. 2. The event has support of Ministry of Human Resource Development and Educational Consultants, India Limited. This mega-event has been instrumental in projecting India as an Educational Hub and enhancing opportunities for international collaboration in higher education. 3. The event will feature a Reverse Buyer-Seller Meet (RBSM), in which about 300 delegates from Africa, Middle East, CIS, Asia (including SAARC) and other potential regions have been invited to participate in B2B and B2G meetings. 4. The delegates will be provided complementary economy class two-way air fare (up to USD 700), three-night hotel accommodation with breakfast, airport pick-up and drop, daily transfer between Exhibition venue and hotel. Contact point for further clarification in regard to the event is Shri Sudhanshu Gupta (sudhanshu.gupta@ficci.com) and Shri Mayank Rastogi (mayank.rastogi@ficci.com). Other details of the event are available at www.ficci-hes.com.